But it can't be from Dolly Clackett. She gave me an Easter egg! : I am a graduate of Starfleet Academy. I know many things. I am a graduate of Starfleet Academy. I know many things. Evening all! Well, after the excitement of last Monday and my 'day in my life' post, the rest of the week was pretty quiet. You guys should be relieved it wasn't a week in my life, seriously. No, not really. Last week was grand, pretty uneventful but good. I don't have much in the way of news to share. On Wednesday I wore my Call Me Betty dress and one of the highlights of my day was a man stopping me on the street to tell me I looked like someone out of a film. He clarified further, saying the film he was thinking of was Grease, and I kind of get what he meant. It was a nice compliment! These shoes fall into the 'I've worn them lots but not bothered to save them yet' camp, so I'm going to call this a Shoeper Shoe Save! They go perfectly with this dress, and I know it's totally unadventurous sartorially speaking, but I love red and white with navy. I spent most of the week looking forward to Friday lunchtime, as Nic and I had made plans with Rick and Lauren for lunch in Kayal. They do a ridiculously good value lunch deal (which I have blogged about before) and excited is an understatement. It's billed as a business lunch so there was much talk of wearing power suits etc but the sun came out, so I had to go with plan B. These are also frequently worn but not yet saved shoes, so this is also a save. Lauren and I were a bit on the matchy side as she had on her cherry Lady Dragon shoes, but it's all good. The people in the restaurant were too busy revelling in the amazingly tasty food to notice, I'm sure. It was a really good end to an otherwise boring work week, and although we had some boring chores to do in the afternoon (going to the bank, going to the post office) it's easier to do these things when you've just spent the hour before having fun with friends. Nic was working so I spent Saturday sewing and reading, but we did go out to do the grocery shopping and go to lunch, and I saved another pair of shoes. I know that seems like a lot but I'm behind in this - I have actually worn lots of the shoes I want to save, but haven't been that good at recording them. 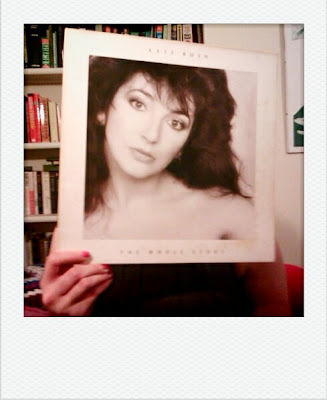 When Nic and I got home from Lysy's house, we were pretty tipsy, so naturally enough it was time to bust out the Kate Bush records and do a bit of dancing. I'm sure our downstairs neighbours hate us for the number of times we've listened to Kate Bush in the early hours of the morning, but do you know what? I don't care - they're noisy twats. I was dancing around to Hounds of Love and I suddenly felt perfectly happy. It's a good song and all (it's a really good song, and the music video is excellent as well) but even Ms Bush doesn't have that kind of power. It's because life is good, and I'm so glad to feel that way. I feel happier than I have done in a long time. I'm sorry to get introspective on you all again, but it's because I feel like I've managed to rid my life of all of the unnecessary complications that were dragging me down. Things are much simpler now, I don't have any of the stupid drama clouding my head now that I once did, and I also know how to avoid it. I feel like I've regained a lot of the confidence that I lost. So, basically, I'm pretty happy right now and that can only be a good thing. 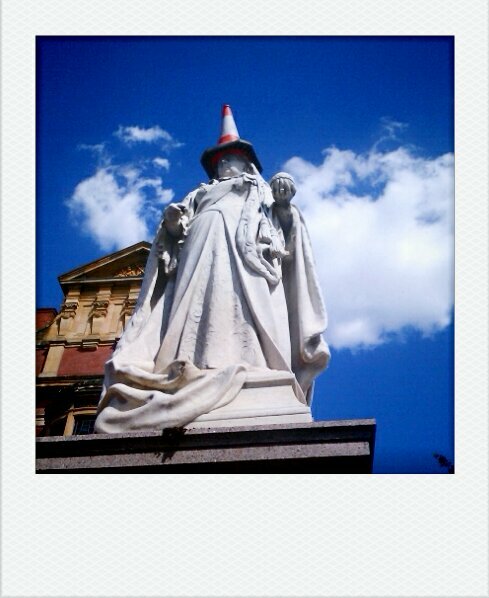 I'm going to leave you with a picture of Queen Victoria with a traffic cone on her head, and then I'm going to go and read my book. I can't tell you how much this made me laugh when I saw it on Friday. I think this is pretty impressive pranking. Anyway, I'll catch you all later. Goodnight!